This new Yearbook addresses the question of how policy, place, and organization are made to matter for a new research field to emerge. Bringing together leading historians, sociologists, and organizational researchers on science and technology, the volume answers this question by offering in-depth case studies and comparative perspectives on multiple research fields in their nascent stage, including molecular biology and materials science, nanotechnology, and synthetic biology. The Yearbook brings to bear the lessons of constructivist ethnography and the ?practice turn? in Science and Technology Studies (STS) more broadly on the qualitative, comparative, and critical inquiry of new research fields. In doing so, it offers unprecedented insights into the complex interplay of national research policies, regional clusters, particular research institutions, and novel research practices in and for any emerging field of (techno-)science. It systematically investigates national and regional differences, including the variable mobilization of such differences, and probes them for organizational topicality and policy relevance. 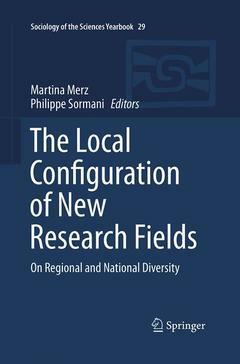 Chapter 1: Configuring New Research Fields: How Policy, Place, and Organization are Made to Matter; Martina Merz and Philippe Sormani.- PART I: POLICY: NATIONALIZING SCIENCE.- Chapter 2: Hidden in Plain Sight: The Impact of Generic Governance on the Emergence of Research Fields; Jochen Gläser, Grit Laudel and Eric Lettkemann.- Chapter 3: Building Multidisciplinary Research Fields: The Cases of Materials Science, Nanotechnology and Synthetic Biology; Bernadette Bensaude-Vincent.- Chapter 4: Placing a New Science: Exploring Spatial and Temporal Configurations of Synthetic Biology; Morgan Meyer and Susan Molyneux-Hodgson.- PART II: PLACE: MOBILIZING REGIONS.- Chapter 5: The Local Configuration of a Science and Innovation Policy: A City in the Nanoworld; Dominique Vinck.- Chapter 6: The Local Articulation of Contextual Resources: From Metallic Glasses to Nanoscale Research; Martina Merz and Peter Biniok.- Chapter 7: Nanodistricts: Between Global Nanotechnology Promises and Local Cluster Dynamics; Douglas Robinson, Arie Rip, and Aurélie Delemarle.- PART III: ORGANIZATION: MANAGING TENSIONS.- Chapter 8: Epistemic Politics at Work: National Policy, an Upstate New York Synchrotron, and the Rise of Protein Crystallography; Park Doing.- Chapter 9: Ecology Reconfigured: Organizational Innovation, Group Dynamics and Scientific Change; Edward J. Hackett and John N. Parker.- Chapter 10: Social/local Problems, Scientific/universal Problems and the Dynamics of Research Fields: A View from Latin America; Pablo Kreimer.- PART IV: MOBILITY: TRANSGRESSING CONTEXTS.- Chapter 11: Patterns of the International and the National, the Global and the Local in the History of Molecular Biology; Hans-Jörg Rheinberger.- Chapter 12: Recasting the Local and the Global: The Three Lives of Protein Sequencing in Spanish Biomedical Research (1967-1995); Miguel García-Sancho.- Chapter 13: Practicing Innovation: Mobile Nano-training, Emerging Tensions, and Prospective Arrangements; Philippe Sormani.